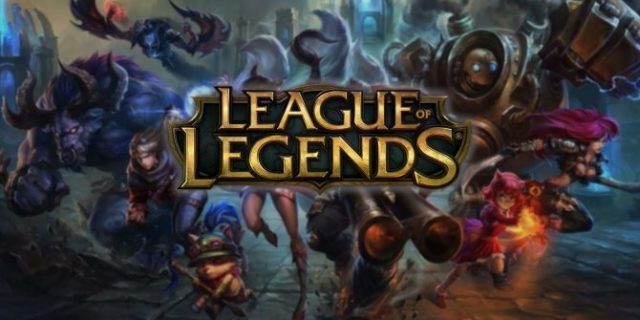 Lolking is a support website for League of Legends and it provides the normal league of legends (Lol) fan with the most current builds, guides, counters, news and more for league of legends. League of Legends is an online multiplayer game where players fight with each other in a battle arena. The player takes on the role of a summoner who controls a fighting champion. This champion has unique abilities which are helpful in each fight against the opponents. The summoner (player) then uses the champion to fight a team of other players. Sometimes, instead of actual players playing, the champion fights bots, which are computer controlled champions. The goal behind the game is to fight the opposing team’s champions and destroy the opposing team’s defensive structures until they reach the nexus, which lies at the center of this defensive structure. After League of Legends became popular, Fishsticks and Ignis became huge fans of the game. They were developers and they wanted to build a place where they could find more information about their opponents whom they faced in the battles. Hence, they decided to build a website dedicated to League of Legends fans. They created the summoner database for their own personal use, at first. They kept growing the database. Eventually, they decided to release the database to the public through their website Lolking.net. lking gathered outside resources to help grow the website even further. In May 2012, Lolking was taken over by the ZAM Network. Built for League of Legends fans, Lolking is a website where you can find all the latest news, builds, stats and guides related to League of Legends. Let us look at each aspect of the website. When you are at the website, you have to click on the menu and select Champion Guides under the heading Builds. After you have clicked on the same, you will be taken to the page with Champion Guides. A quick glance at the page shows us that there are guides available for all the champions in the game. You can either select the champion directly whose guide you want to read, or you can search for the champion. The game also allows you to filter the kind of champion you want. You can filter by the role of the champion. The options available in the same are Top, Mid, Jungle, ADC, Support. These are the various roles that a champion can perform in the battle against your opponents. Some champions are better at a particular role while others are better at other aspects of the game. You can also choose to filter the champions by their price. The two options available are free and sale. As the game keeps many champions for sale, these champions are generally amongst the most powerful champions. You can use the two filters together to find the champion you are looking for easily. The page also allows you to sort the list by many different ways. A-Z – If you are looking for a champion whose name starts with A or B, this kind of sorting will help you find the champion quickly. Z-A – If, however, your champion’s name starts with Z, Y, X and so on.. this sorting will help you find the champion quicker. WIN – This sort helps you find a champion based on the win rate of the champion. For example, if you sort by win rate, you will see that Yorick has the best win rate. The next best champion is Garen, followed by Ahri, Nami, Sion, and Amumu. Popular – This sorting option helps you sort the champions based on their popularity. There are some champions who win more matches or who are excellent at a certain aspect of the game. These champions are very popular and you can find them easily through this sorting option. For example, Jhin is the most popular champion. Yasuo is the next most popular. After Yasuo, Miss Fortune, Jax, and Lee Sin are the three other most popular champions. Ban – These are the champions who are banned most by the players. You can search for players who have been banned the most by using this sort option. You also have the option to search for a guide by searching for the name of the author who wrote the guide. Once you have arrived at the character’s page you wanted to read the guide to, you will be shown many guide options to read. Here, you can choose which guide you want to see. There are too many options for most champions. Hence, you will need to sort as per your requirement. If you want the guide with the highest rating, select the sort option as Rating. You can also sort by the number of views, date modified, date created and lolking score. There will also be a few featured guide for each character. The page for the character will also show you the number of likes for each guide, along with whether the guide is for the latest patch or is stale. You should preferably select the guide for the character with the latest patch. Although most features of the character will be similar, there may be some changes to the character. This is why reading the latest guide will be more useful than reading the stale guide. As you can see in the above image, each guide also shows you a few information points about the guide. At the top left of the guide featured image, you can see the name of the author. At the top right, you can see the number of likes that the guide in question has received from the community. The bottom left shows you what kind of guide it is. For example, the ones in the images show the top guide. There are also other options like the jungle, MID, ADC, support, etc. Finally, at the bottom right you will see whether the guide is stale or fresh. In the image, you can see that the guide featured at the top is stale while the other two sides are for the most recent patch. Let us now select the second guide and see what data the guide contains. Once you have clicked on the guide you like or want to read, you will be taken to the page of that guide. Once on that page, we can see the table of contents for the character’s guide that we selected to read. In our example guide, we can see that the table of contents contains the following data. 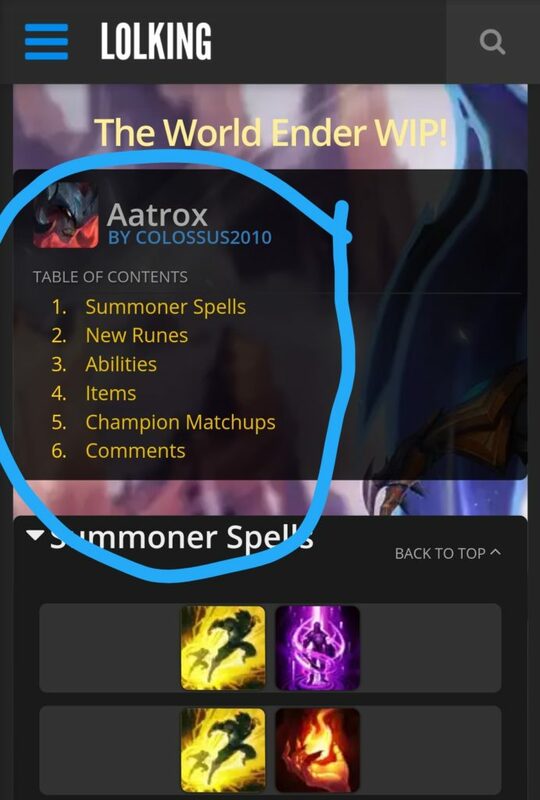 We can see that the table of contents for this character’s guide includes summoner spells, new runes, abilities, items, champion matchups, comments. Each of these subheadings inside the guide gives specific information about the champion. Looking at the summoner spells, we can see the images for the spells. Once you click or highlight on the image, depending on the device that you are using, a pop-up will give you more information about the spell. For example, in our Aatrox guide, we see the spell for Teleport. The pop-up tells you about the features of the spell. It tells you, for example, how long before the spell is complete, what it does and how long before you can use the spell again. Similar pop-ups give more information on the different spells available to the summoner for each champion. You can choose to read one such guide to understand more about the champion or you can browse through many such guides to get a complete understanding of the champion. Either way, the guide proves to be very helpful to new players who want to select a champion to play with and want to know as much as possible about the champion before deciding to finalize it. One of the main purposes for building lolking was that the developers wanted to know the stats of different summoners. Even today, this is one of the most important purposes that most of the LolKing users use the website for. It is one of the easiest ways to learn more about the opponent you are facing in the battle. Before understanding how to defeat an opponent, getting more information about him will be very useful. You can find the stats of any opponent you are looking for by clicking on the summoners subheading inside the menu. Once you are on the summoners page, you can then start looking for the summoner that you are searching for. On the page, you can see an option to search for the summoner you are looking for by his or her name. Simply enter the name of the summoner in the search box and you will get a list of summoners with similar names. The page also displays a list of featured summoners who are at the top of the ranking in League of Legends game. As you can see in the image above, the search box at the top and the featured summoners below. You can proceed with searching for the summoner you are looking for. 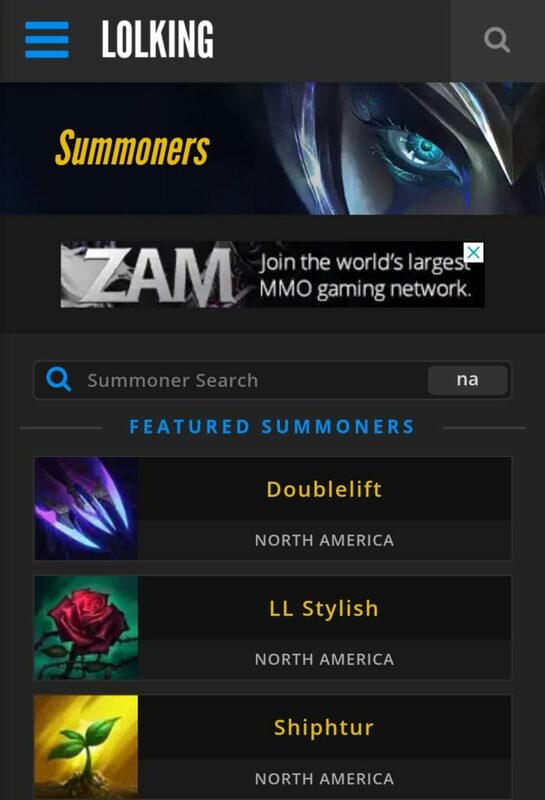 For the purposes of this guide, we will click on the name of one of the featured summoners and look at the information the website displays for the summoner. We will look at the summoner stats for Doublelift. Here is how his summoner stats page looks like once we have clicked on his name. At the top of the page, you can look at the title, which is the name or username of the player or summoner in the League of Legends game. At the top left, you can see a number. And on the top right, you can see the player’s Lolking score. For Doublelift, the Lolking score is 2565. The bottom left points are Master I points. 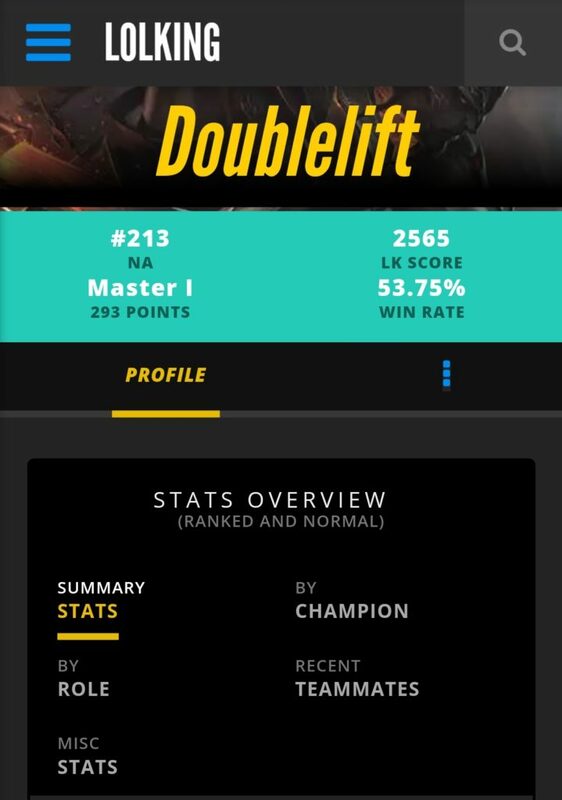 Doublelift has 293 Master I points. On the bottom right of the score list, you will see the win rate of Doublelift. Here, we can see that Doublelift has a win rate of 53.75%. Scrolling down, we see the profile of the player. There is an option to see the stats overview of the player, which can be seen as a summary of stats or sorted by the champion, by role or by recent teammates. You can also look at the miscellaneous stats of the player. The win rate of a player shows how good he is at playing the game. A win rate of 53.75% signifies that the player wins more than 1 out of every 2 battles he takes part in. The win rate may vary based on which champion the summoner decides to use in a certain game. And hence, you must also look at the kind of champion that the player was playing with when he got the highest win rate. If you scroll down a bit, you can see all the matches that the player has played recently. You will also see the result of the match. You can choose to see all the matches or you can filter between ranked and normal matches. One of the interesting things Lolking provides its users is the option to watch a particular Champion in the form of 3D models. It is a great option to watch your champion in action before you decide on the champion. It is also a nice way to watch your character’s animation in a different Lolskin. For example, Ashe looks good in her original Lolskin. However, Ashe looks wonderfully godlike in her Cosmic Queen Ashe Lolskin. We have selected Ashe to look at the various things we can do in the 3D model option of Lolking. How to Select Your Champion To View in The 3D Model? Once you are at the 3D model page you can see the below options. Deciding on the options will help you choose your champion. For example, you can select the champion from the drop-down menu. In the above image, you can see that we have selected Ashe.Once you have selected the champion that you are looking for, you should next select the Lolskin which you want to see the 3D model in. 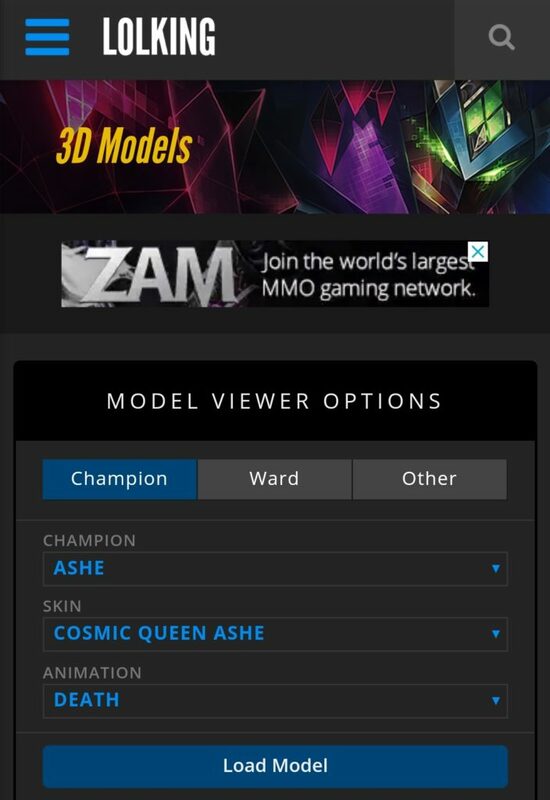 After selecting both these options, you must click on the load model button below in order to load the 3D model of the champion that you have selected. The page builds and refresh and it will load the champion with the Lolskin that you have selected. Now you will find the new option below the two options. You will see an option to select the type of animation you want your champion to be doing. The model will generally load and do an Idle animation. You can select from various other options like taunt, death, run, joke, recall, spell, etc. Choosing the type of animation will load the character doing that animation immediately. League of Legends is a game where the champion you select greatly influences not only your style of play but also the chances of winning. Hence, many champions are very popular among summoners, while some champions are banned by many players. Hence, it is crucial to know more about a champion before playing with them. LoLKing has data on all champions. To get to this, you have to click on Menu and then click on Champions button. Once you click on the button, you will be taken to a page that lists all the champions. By default, the champions will be sorted in alphabetical order (A-Z). You can also sort the champions by their win rate or by their popularity or ban rate, etc. You can also filter the champions based on the role you want your champion to play. When you have clicked on a champion, you will be redirected to a page that has builds, guides, stats and more about the champion. The champion homepage will display the build of the player, probably from the latest patch. It will also show you whether the champion is very popular or not. Below it, the page displays the Pre-Game Build data of the character. The page will show you the win rate of the player, along with the precision of the player will different techniques. But it’s not as if only Lolking helps players with these data. There are a few competitors too. Let us look at two alternatives to LolKing. Another website similar to LolKing, which is probably the biggest competitor to Lolking is LoLSkill. This website is also based around the idea of providing users with data about other summoners. LolSkill was started by Linnun in the month of July 2013. Linnun got the idea to start Lolskill while he was leading a German Teamspeak server for the players of the game League of Legends. He thought about creating a bot which notices as soon as someone enters the game and edits the description of the channel by showing any ongoing matches in that channel. Pretty soon, Linnun thought of another idea. If he already had enough player data and knew which match was going on, why not try and predict the result of an ongoing match. So, Linnun started calculating and measuring the win chance of a particular summoner in a particular match. To know this, Linnun needed data on the performance of each summoner with the champion the summoner is currently playing with. This is where Linnun got the idea for LoLSkillScore and he developed the same. Eventually, Linnun decided to create a website that would show all this information. This was the birth of LoLSkill. Soon, the website grew in size and became hugely popular within a very short time. LolSkill is pretty similar to LoLKing and does most of the stuff that LoLKing does. It helps you look for champions, summoners, etc. and also helps you stay updated with the latest news related to League of Legends. After LoLNexus suddenly disappeared, LoLSkill is the best alternative to LoLKing at the moment. LoLNexus was another great competitor to LoLKing. However, it has gone offline for some time now. LoLNexus helped you search for live games. They also had data on the up to date build and skill orders from the best League of Legends summoners. To find a particular game, you could filter by a champion or by rank or by queue type or promotion status, etc. LoLNexus also has forums where players could discuss all matters related to League of Legends. This includes data about other players, discussion about various champions, news related to League of Legends, patch related discussions, download resources, 3D model discussions, etc. 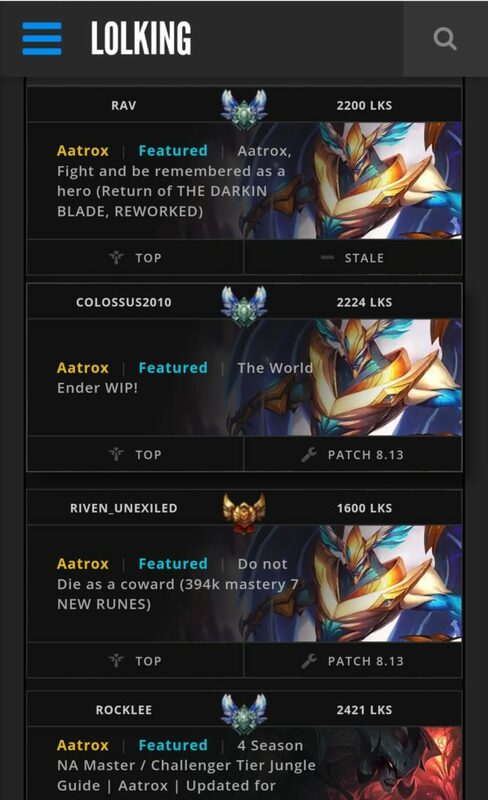 The homepage of LoLNexus also had a link to the various champions. You could look for a certain champion and get information about these champions after clicking on the champion you want to know more about. Before the website disappeared, it was one of the best alternatives to Lolking and Lolskill and was very popular among League of Legends players. There was a long time when League of Legends players had no information about the other summoners. They simply played the battles without having much info about the opponents. Now, they have LoLKing and other websites that give them complete data about the summoners. These websites also help the user understand more about the champion they are playing with, along with showing them which champion is more popular with other summoners. LoLKing also showed 3D models of the champions and helped them see their champion in action. If you play League of Legends regularly, this is one of the best websites to visit and learn more about. So, how did you like our review of LoLKing? Did you find all the information you were looking for? Should we have added more data? Is there something we missed? How did you come to know about LoLKing? Share these and anything else you want to share with us in the comments section below.LoLKing Review: League of Legends Builds, Guides, Champions, 3D Models, and more here..